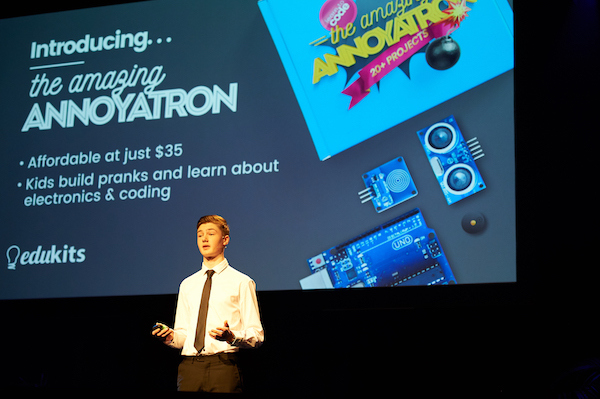 Australia Post Regional Pitchfest winner Michael Nixon with his invention The Amazing Annoyatron. With her desire to change the world ‘one flower at a time’, ACT Pitchfest winner Nipuni Wijewickrema from GGs Flowers did Canberra proud when she competed against her state counterparts at the Australia Post Regional Pitchfest Finals last Friday. Although she wasn’t the overall winner, the judges and an audience of more than 300 people warmed to the impressive pitch of this passionate young woman and her role in starting a socially sustainable business that aims to provide people with disabilities with meaningful employment opportunities. Nipuni is one of the faces and stories celebrated by Pitchfest. There are literally thousands of Australians who are taking up the opportunity to be the master of their own destiny through running a business from home. They are designing in their bedrooms, tinkering in their garages and working on their new business, while they are dreaming of selling to the world. Greg Sutherland, Chief Innovation Officer from Australia Post, recognises that this is the future of work and so did most of the audience in the room, as well as the entrepreneurs competing in this regional “Pitchfest”. The finals were held in Wagga Wagga, the place from which the idea was conceived. Australia Post took up the brainchild of Dianna Somerville, who felt that regional entrepreneurs were not served well compared to their urban counterparts and set out to give them exposure. So, with the sponsorship of Australia Post, and the support of the Melbourne Accelerator Program (MAP), they set out on a regional quest to find the best business idea through pitches in regional areas of the country. Each state and territory had entries from hopeful entrepreneurs with a great idea for a business, and competing for the privilege of the exposure, the possibility of investment, and of course, the coveted first prize. Alongside Nipuni, there were a variety of other impressive State winners competing in the national event. These included Julie O’Donohue from Victoria with her business, Next Address. It’s a real estate business platform which is rather impressive. From Tasmania there was John Hyslop with his business, Deviant Distillery and he gave an impressive pitch which was obviously passion driven, as was the Illegal Tender Rum Co run by Hayley Wells and Codie Palmer. The judges were given a tiny taster to help them make their decision. Then came Michael Nixon, with the Amazing Annoyatron. The innovator here was a Year 9 student who has invented a kind of Lego, but virtual, and he hails from NSW. From Queensland, we heard from David Crane, with SiteSee, a cell tower analysis service for telcos. Fiona Park impressed with her hosiery for plus sized women, Emmaretta, even though they don’t wear hosiery in the Northern Territory! Finally, Edufolios, presented by Selena Woodward, from South Australia, moves forward the plight of teachers who are keeping records of their Professional Development in a virtual space. It was an impressive array of ideas and pitches that excited and inspired the audience. The Minister for Small Business, The Hon. Michael McCormack, MP was one of the judges, and also a local citizen of Wagga Wagga himself and was most invigorated. “I am constantly amazed by the innovation and ingenuity of Australians of all ages and from all walks of life. I look forward to seeing the latest business ideas from our inspiring rural and regional entrepreneurs,” he said. Other judges were Greg Sutherland, (CIO) Australia Post; Jane Cay, founder of Birdsnest, an online fashion business based in Cooma; Martin Adams, chairman of the MAP Advisory Board; and finally, Kerri Lee Sinclair, an investor in technical investment and venture capital, having had much experience in the start-up space herself. The MC was an excellent choice and kept the audience revved up and is a Wagga Wagga based entrepreneur in the television and film industry. We all held our breath as the judges made their final decision and entered the auditorium. The announcement did not come as a great surprise. 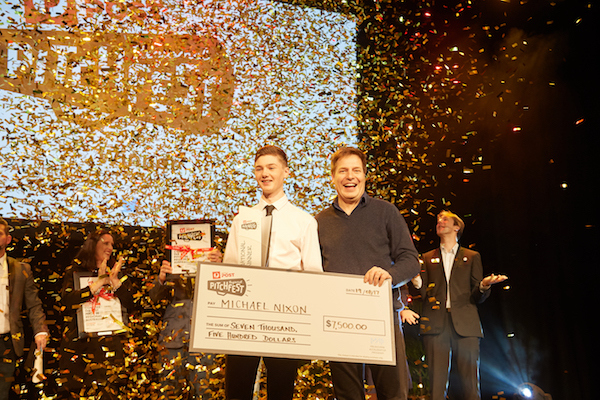 The winner was the Yr 9 student from NSW, Michael Nixon with his invention The Amazing Annoyatron! The runner-up was John Hyslop from Deviant Distillery. Nipuni from Canberra did miss out, but has already proved to be a winner at home in the ACT. I am sure she didn’t mind about this amazing young man winning! The world is obviously going to be his oyster, and judging by the reaction of the crowd, as well as the other competitors, the judges had made the right decision!